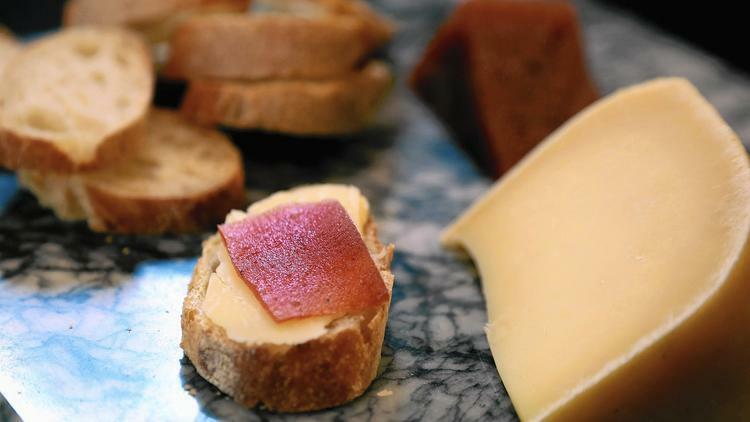 Grand Central Market | Press Coverage | Los Angeles Times | When you find that one cheese (or 10) that you can&#039;t live without, you&#039;ll find ways to incorporate it into every meal of the day, including a couple afternoon snacks. When you find that one cheese (or 10) that you can't live without, you'll find ways to incorporate it into every meal of the day, including a couple afternoon snacks. Such is the case with the Bishops Peak cheese made by Central Coast Creamery. It's an Alpine-style cow's milk cheese made using propionic bacteria, which means it doesn't have the small holes found in other Alpine cheeses. It's aged for seven to eight months before hitting the cheese counter. The result is a cheese with an assertive, nutty flavor that gives way to a buttery texture at room temperature, like a mellow cross between the best Gruyère and an aged Gouda. To bring out a slight sweetness in the cheese, serve it with a sliver of membrillo and some good bread. The cheese is currently only available at DTLA Cheese at Grand Central Market, the Cheese Cave in Claremont and the Patio on Goldfinch in San Diego, but Central Coast Creamery cheese maker Reggie Jones says you can expect to see a lot more Bishops Peak come August and September, due to its production of a new aging space.